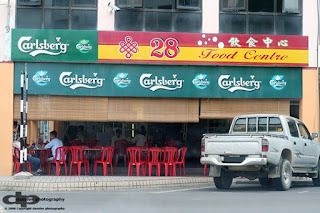 And yes, number seems like a trend for many coffee shop, cafe and food centre around Miri now. It is quite easy to remember but at the same time quite confuse to tell which is which if you are not familiar the location here. 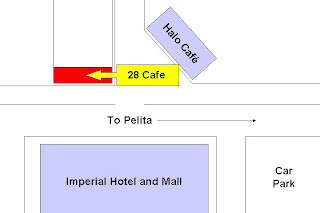 Situated in town, opposite Imperial Mall and also opposite of Halo Cafe. It is known by many of their great Beef Noodles and Laksa! This is what i am going to show you in this post! If i am not mistaken that the cooking style is origin from Kuching. For their beef noodles, it is served in a way where the noodles is on one plate which the beef with stock is served separated with a bowl. Although i did not try it before ( For those who has been reading my previous posts, i do not eat beef), but the smells are great and look at the stock, hardly see any oil! 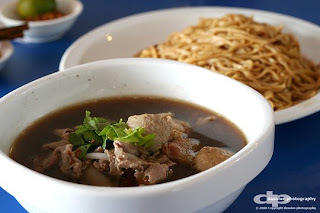 No wonder their beef noodle is being recommended as one of the best available in Miri. Their laksa is another hot-seller for this place. 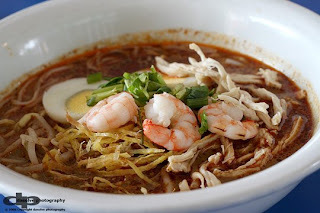 Comes with rice noodles, bean sprouts, shredded chicken meat, eggs, prawns and of course, the lovely laksa stock goes with all of them. The aroma just went wild like the headless chicken in your mouth and you will sure enjoy the every mouthful of it. Another must-try item in your list as recommended by many people in Miri. The stall has been moved to their own shop.. "Nancy Beef Noodle" near Kurnia Insurance building at the corner and also at the back of Kaya & Toast. ah darn, i went there last week to try the beef noodle but was told there no more beef noodle. i didnt see the comment. darn. where is Kurnia Insurance building? is it near waterfront?